This rose is the state flower of Georgia. 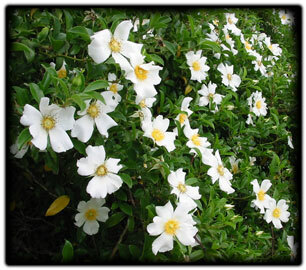 Often used as a natural fence in the South 'Cherokee' has abundant barbed thorns. In the spring those thorny canes are covered in pure white blossoms with distinct yellow stamens. We always look forward to seeing this spring bloomer burst!